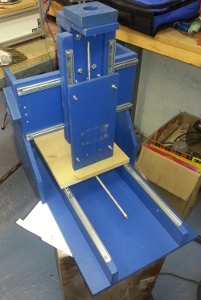 Due to low tolerances on the wooden CNC frame (see below) compared to the High Accuracy most members will require for projects such as PCBs or Aluminium Panels, we've decided to proceed with the CNC project using V-Slot profiles with ACME drive. We plan to use the stepper motors and drivers and the Beaglebone black previously intended for the wooden CNC. The profiles and ACME threads will be purchased shortly by one of our members and construction should begin next month. We hope to get it running by the end of this summer (2018). Construction will take place at the weekly DIY Synth Group. A suitable spindle motor, collet and drill bits. Aluminium Gantry & Joining plates, stepper mounts. (We may have these cut on someone else's CNC). A Dust shield made of Acrylic or other transparent material. If you have these materials and wish to donate them you can contact us or take part in the discussion over at https://forum.gmsn.co.uk/t/cnc-router/621/2. BeagleBone Black plus Probotix PBX-BB board, kindly donated by Anderw B. A CNC machine will allow people to build things in the Electron club, for example, circuit boards cut from copper plate, among other things. This video is a reasonable primer on the subject. The current plan is to hold an event on a Saturday were we put all this together to build a CNC machine. Initially, for testing purposes, we'll have a pen so it will draw things. The remainder of the components required should be in the room, somewhere. Later we'll figure out which route to go for drilling (dremel, brushless spindle etc). The details of when this will happen are pending, please watch this space and the mailing list. Should you have any questions, or wish to donate related equipment please contact us. The machine itself is very robust. It is likely approx. 40 years old, but for what it is, it has seen only a very light use. It was used to guide an ultrasonic probe in a water tank. The base and the bridge is solid steel; it is very rigid. It weights no less than 300kg. High precision rails on both axes. No play. No rust, no damage. Noiseless. Linear motors. These are noiseless. Known coil resistance: 14 ohms. Tested working with 2A current, although, we'd have to test how much can they take before overheating. Ideally, they need onboard temperature monitor. Ultra high precision linear encoders, with a sine-cosine output. Tested works OK at 5V supply. Elastic scarf on both axes. This makes it a very pro-looking machine and makes it hard wearing. I believe it can still serve the good of humanity for many years to come. We need to build a motion controller for it. *machinekit* has been suggested. As far as I understand, the club has a beaglebone black waiting for such opportunity. We need to supply an end effector - e.g. 3D printer head, or other. Risk: Environmental - office conditions versus dust, noise, vibration e.t.c. * The machine is not at this point operable. The servo amplifiers are missing and there is no end effector on it. * When powered, the movement of the primary axes is mostly noiseless. This is because these are linear servo motors optimised for ultrasonic research and hence optimized for not generating acoustic noise (which would interfere with measurements). These kind of motors are very *unlike* stepper motors (which would buzz). * For a 3D printer head, we can all agree that regular ventilation & noise would be acceptable. Possibly, keep the window open to prevent accumulation of fumes. Otherwise, the risks are low. * For a general purpose CNC machine: I am afraid that this table is not really suitable for a general-purpose CNC operation. This is because the linear motors will have a rather limited force that they can exert. Hence, I believe that with current motors, metal and wood processing would not be feasible. One could think about installing stronger motors, but really, that would cost a lot. In any case, if we decide to do this, the dust would have to be extracted up to a cleanroom standard (possible, but not cheap) and the noise would be a serious consideration. High-quality spindles (with controlled runout) actually do not create that much noise, but they cost cost cost. * For a PCB router: This is much more possible to do. It is possible to build a low power dust extractor from base materials ( i actually have all the parts that I can contribute). The noise would be manageable. We would need to buy in or make a high-quality spindle; budgetary cost is ~200-500gbp. * A spark erosion processor (EDM): In such case, there is no dust, no noise, and the end product could be of extremely high quality (injection moulds are often finished with this technique). This method is in general, very slow, but on the up side, it is noiseless and easy on the enviroment. EM interference can be managed by enclosing the working area in a Faraday cage. Budgetary cost: Unknown, but no less than 500gbp. [Jurek]: I do have to give You that this machine could potentially be an H&S issue. It has heavy moving parts. There is no sharps, but there is a potential for finger capture if one puts his finger into just the right place at just the right time. The risks are mostly similar to the ones coming from a regular 3D printer (that we already have in the club) and less than the motorized table saw that is also already there. (proposal 1): Build it into a lockable cabinet to make it even more obvious that it is not to be messed with. (proposal 2): Instead of a cabinet, we could install a nightlatch on each of the two heavy axes: https://www.ironmongerydirect.co.uk/product/yale-77-traditional-nightlatch-nickel-bronze-603896 ; there is enough space there to install it, and it would prevent people from moving the axes by hand (and trapping their fingers in the process). Since it is ours, it is OK to drill and tap holes. We can modify it any way we want. [Bob]: In case if the interest stalls, it will be difficult to get rid of it. (proposal 1): I suggest that we start a fund, to be held by the CCA, in which there will be a deposit to cover the machine’s eventual disposal. I guess we might need to find somewhere in range of 300gbp . https://www.yell.com/s/metal+collection-glasgow.html since there is easily 300kg of metal in this thing, I would guess they might be interested in picking this thing up for free from us.